"According to Maryland Motor Vehicle Administration data, no pedestrians were injured by vehicles in city school zones in 2012 or 2013. 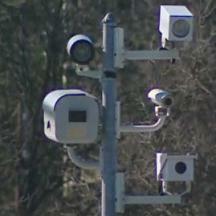 In 2012, Baltimore had 83 speed cameras monitoring motorists and generating millions of dollars in revenue. In 2013, Baltimore's speed cameras were turned off for all but about three weeks. They have not been turned on since. Citywide, 261 pedestrians under age 18 were injured by vehicles, with one killed, when the cameras were running in 2012. In 2013, with the cameras off, 221 young pedestrians were injured and none killed. Adrienne Barnes, a spokeswoman for Baltimore's Department of Transportation, called the statistics a "positive development" that shows the agency is improving safety." Baltimore's speed camera program was in full operation for most of 2012 except for the last two weeks in the year. The program was then shut down and only restarted for a few weeks in 2013 before being shut down again for the rest of 2013, amid revelations of new erroneous citations. The pedestrian incident data represents a 15% decline from 2012 to 2013, and in fact there were no pedestrian collisions involving students i school zones where the speed cameras would have been running. Overall, data from the city showed "mixed results" when it came to safety. Overall traffic accidents in the city increased by 1.2% from 2012 to 2013, however the number of accidents in the city resulting in injuries fell by 4.5%. Traffic fatalities in the city did not change at all from 2012 to 2013.